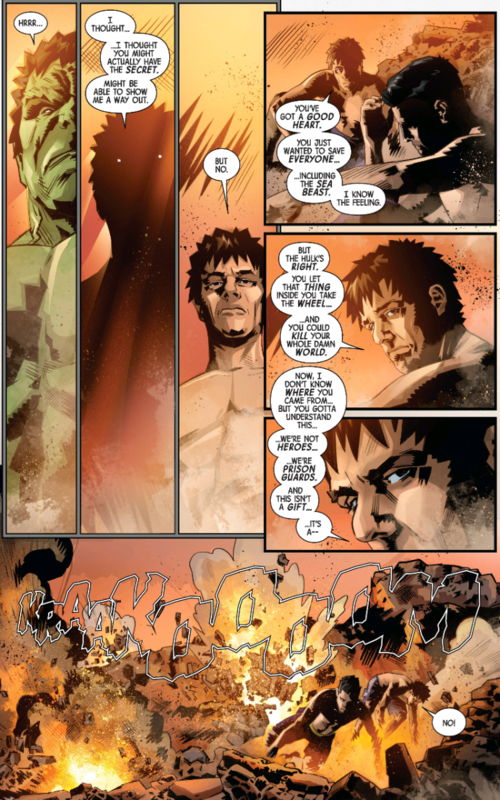 Amadeus Cho seems to make a strong connection with the young Bruce Banner, but the Hulk has nothing but disdain for Amadeus. He basically considers Amadeus a liar and a coward for not embracing the full rage and power of the Hulk. In the end, Banner ends up disappointed in Amadeus too. He had hoped that Amadeus had a secret to controlling the Hulk’s power, but he realizes that Amadeus is barely in control too...and at some point, Hulk will destroy Amadeus’s life too. I thought this was a really strong issue. I like that Amadeus has some control over his monster, but pretty much from day one we keep getting told “it’s not going to last.” And here we get Banner confirming that. I think the “monster in the trunk of a car” analogy they keep going for feels strained, but it still creates some strong characterization for Amadeus, especially when compared to Banner. 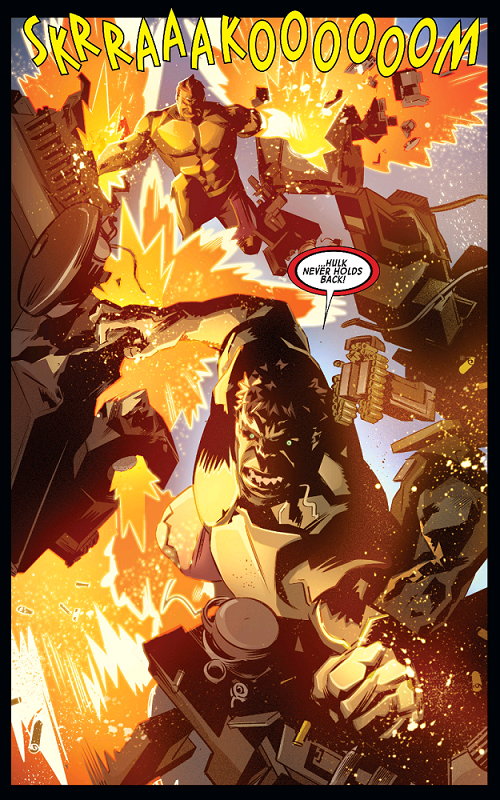 Greg Pak has a real strong handle on Amadeus, and TOTALLY AWESOME HULK is usually a great read. I think that is one of the strengths of GENERATIONS that most of the books are being written by the writers on these characters’ main series. Sometimes when these newer characters have appeared in other books, they don’t quite feel right, but Pak has a strong handle on both Cho and Banner here. Both characters feel deep and important to the story. Matteo Buffagni is a name that’s popped up on my radar a few times. He did a two-part story for DAREDEVIL starring Elektra that I really liked. He also did the DARK KINGDOM arc of AMAZING SPIDER-MAN (Vol. 4 #6-8) featuring Mister Negative, Cloak and Dagger. He just has a really nice style to his work. It’s just got a real gritty feel to it, and in the right story, it is a great look. This issue in particular shows his strengths as an artist. I do think I would have preferred if we had a better understanding of what GENERATIONS is and when is it supposed to take place. It’s clear that from Amadeus’s perspective this takes place after CIVIL WAR 2 because Banner is already dead, but it’s not clear if this is connected to SECRET EMPIRE at all. I assume this takes place after SECRET EMPIRE and is connected to Marvel’s LEGACY storyline, but that is not particularly clear from this issue. The sad part is that if they didn’t add extra issues to SECRET EMPIRE, this probably would have come out at the end of SECRET EMPIRE and been a little more clear. Marvel created the same confusion with SECRET WARS with many issues set after SECRET WARS coming out before the mini was over. This didn’t really take away from my enjoyment of this particular issue, but if you are trying to appeal to new and old readers, you need to take these things into consideration. I also think that $4.99 is a little high for this, especially considering it had several variant covers, and it’s the first of ten GENERATION specials. I know that we did get 32 pages of story here, but so much of it was big splash pages. If they had trimmed down the big monster fight in the end, you could get pretty much the same story for a bit of a more reasonable price. But aside from that, I did enjoy what this comic had to offer. Lots of action and some strong characterization for both Hulks. The art and writing were top notch, and I am real curious where Amadeus goes from here when Marvel Legacy starts up. Probably could have been $3.99 with a few less splash pages. Still no clear sense of what GENERATIONS is all about. Overall, I would say yes, though I could make the argument that $3.99 is a better price point, especially for a series of ten comics. But I don’t regret buying it, and I will definitely pick up the rest of the specials.